We report here experimental results of yield strength and stress relaxation measurements of transparent MgAl2O4 nano-ceramics at high pressure and temperature. During compression at ambient temperature, the differential strain deduced from peak broadening increased significantly with pressure up to 2 GPa, with no clear indication of strain saturation. 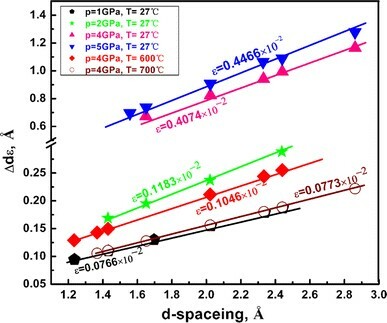 However, by then, warming the sample above 400°C under 4 GPa, stress relaxation was obviously observed, and all subsequent plastic deformation cycles are characterized again by peak broadening. Our results reveal a remarkable reduction in yield strength as the sintering temperature increases from 400 to 900°C. 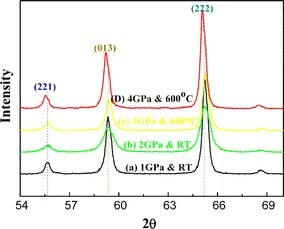 The low temperature for the onset of stress relaxation has attracted attention regarding the performance of transparent MgAl2O4 nano-ceramics as an engineering material. It is generally believed that nano-grained ceramics have their unique mechanical characteristics that are not commonly found in their coarse-grained counterparts . Strength is an important aspect of material for mechanical and particular applications under loading and static pressure. In some case, it is desirable to optimize strength to improve performance. One important example is ceramic armor . Transparent MgAl2O4 ceramic has received considerable attention and has been widely studied [3–6] because of its high melting point, good mechanical strength, high resistance against chemical attack, and extraordinary optical properties [7–11]. Presently, extensive work has been performed in studying the fabrication [12, 13], micro-morphology [14, 15] and transparent mechanism  of transparent MgAl2O4 nano-ceramic. However, there is limited research on investigating one of the fundamental parameters of transparent MgAl2O4 nano-ceramic the yield strength at high pressure and temperature. The aim of this work is to study the yield strength of transparent MgAl2O4 nano-ceramic at pressure up to 5 GPa and temperature up to 900°C through the analysis of the shape of X-ray diffraction lines. We carried out X-ray diffraction experiments on transparent MgAl2O4 nano-ceramic using X-ray (CuKα) diffractometer (Model DX-2500). The nano-MgAl2O4 powder, with a median particle size of 30 nm, was prepared by a low-cost melted-salt technique . Two separated layers of nano-MgAl2O4 and NaCl cylinder were loaded inside a cubic pyrophyllite cell, which is a pressure-transmitting medium, and assembled to the press-standing piece with other modules including a carbon heater. The temperature was measured by a Nichrome-NiSi thermocouple, which was passed through the press-standing piece in advance of calibrating the sintering temperature. The samples were compressed from 1 to 5 GPa at room temperature and then heated from 300 to 900°C under 4 GPa. Such defined strain ɛ can be derived from the slope of Δd ɛ versus d(P, T) plot (Fig. 2), which is an image of the complex contributions to the overall peak width changes. Figure 2 shows the significant slope changes associated with six selected pressure–temperature conditions. With increasing pressure from 1 to 5 GPa at room temperature, the derived differential strains increased dramatically, such as ɛ = 0.0766 × 10−2 at P = 1 GPa and ɛ = 0.4466 × 10−2 at P = 5 GPa, respectively. The strains described here are derived from the peak broadening, which are different from the regular strains . As temperature (above 400°C) is increased at constant pressure (4 GPa), there is a rapid reduction in the differential strain, which is probably caused by thermally induced strain relaxation because of a small increase in the internal cell pressure. The grain size, especially when it goes down to nano-meter, contributes significantly to the diffraction line broadening . Hence, we investigated details about the dependence of the differential stress as a function of pressure, and temperature could be revealed by introducing the grain size in the same plot. The strains have been derived for sample and for all high pressure/temperature observed. The strains are then converted to stresses through a stress–strain relationship of σ = Eɛ where E is Young’s modulus . We obtain the Young’s modulus values of 294 GPa for samples by nano-indentation experiment. The calculated differential stresses and average grain size at various pressure and temperature conditions as blank-squares and solid-circles plots, respectively (Fig. 3). As pressure increases, we observed two obvious yield points for samples, one at P = 3 GPa in the elastic deformation stage and the other at P = 4 GPa. We think that the first yield represents “micro/local” due to the grain-to-grain contacts and thus local plastic deformation because of high stress concentration, and the second yield represents the onset of “macro/bulk” plastic deformation of the entire sample. Moreover, there is a slight addition of differential stress after the yielding when pressure changes from 4 to 5 GPa. Meanwhile, the diffraction peak widths do not vary as much after the entire sample yields. Our experiment results show that the dislocation density of the sample reaches certain saturation . We studied temperature effects on the yield strength of sample at 4 GPa. As temperature is increased to 400°C at constant pressure (Fig. 3, right), there is a dramatically addition in the differential stress, which can be explained on the basis of our early discussion . Above 400°C, the stress drops drastically with heating to 700°C due to thermally induced stress relaxation. On the other hand, there is a slight negative slope in the differential stress with the temperature above 700°C, which indicates that the sample gradually approaches a stress-free state. The plot still shows grain size effects on the sample at this high pressure and temperature (Fig. 3, blue-solid-circles). Figure 3, left reveals that there is no apparent grain growth at different high pressure. However, as temperature is increased to 700°C (Fig. 3, right), there is a fast grain growth. The results show that both stress relaxation and grain growth occur simultaneously during the temperature increases. To further take this interpretation, Palosz  and Gleiter  developed a model for nano-crystals, which are generally viewed to consist of two structurally distinct components, a crystalline core and a surface layer. The differential strain may also be due to the difference in elastic properties between these two components . As grain size gradually grows with increasing temperature, the distinction between these two components is expected to diminish, which may also explain the more rapid decrease in the strength with increasing temperature. In summary, yield strength is an important constitutive property of materials to define the onset of plastic deformation. And we have shown the yield strength of transparent MgAl2O4 nano-ceramic as a function of high pressure/temperature. The excellent data reveal that the differential stress in nano-ceramic decreases as defects decrease during temperature increase, while grain growth further sharpens the diffraction peak. More importantly, the low temperature (400°C) for the onset of stress relaxation has attracted attention regarding the performance of transparent MgAl2O4 nano-ceramics as an engineering material. This work was supported by NSFC of P. R. China under grant No 50272040, Fok Ying Tong Education Foundation under grant No 91046, Youth Foundation of Science and Technology of Sichuan Province under grant No 03ZQ026-03, NSFC of P. R. China under grant No 50742046 and NSFC of P. R. China under grant No 50872083.